Hunny is 2 years old. Now spayed. Vaccinations have been restarted and she is microchipped. Hunny came in via a vet who contacted us as her owner wanted to have her put to sleep for biting her mother. We took her in as she just appears very nervous. 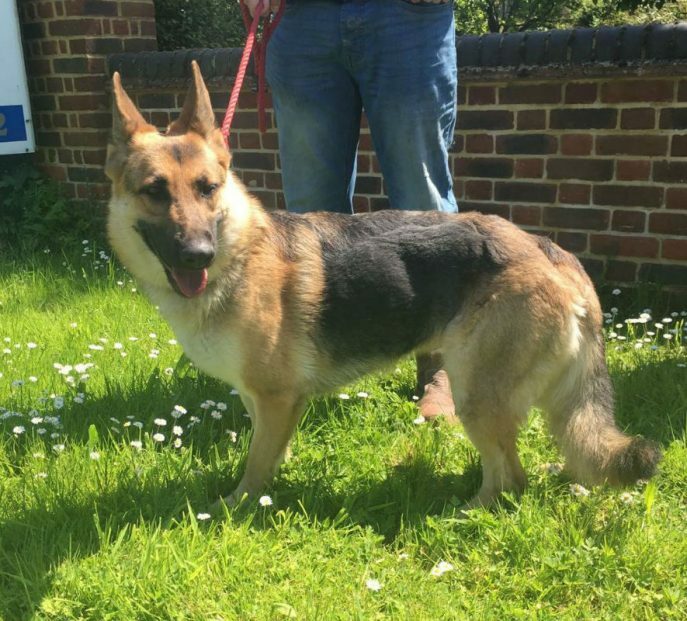 She met a few dogs whilst in foster and whilst not showing any aggression wanted her own space. 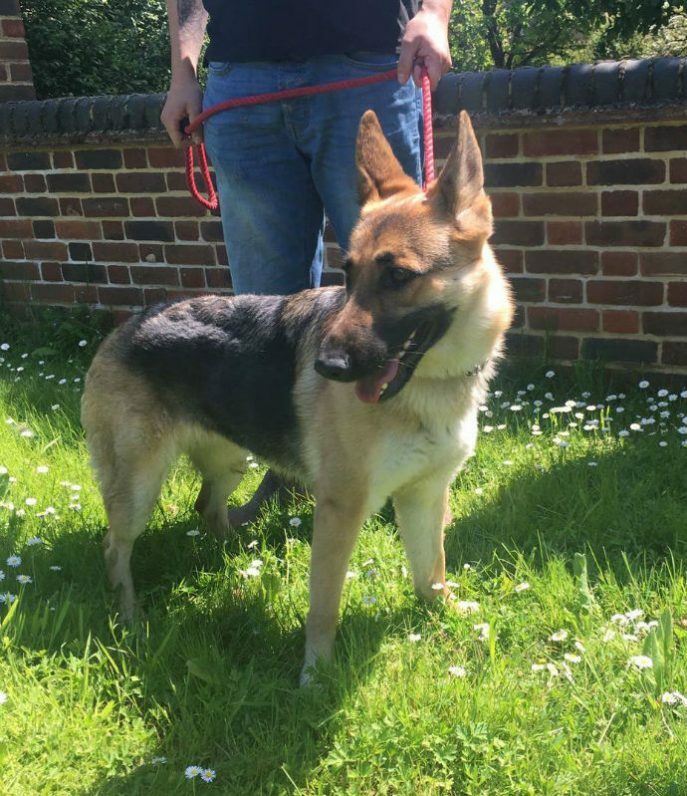 We are told she pulls on the lead and has no recall but has some basic commands. No to young children and cats. 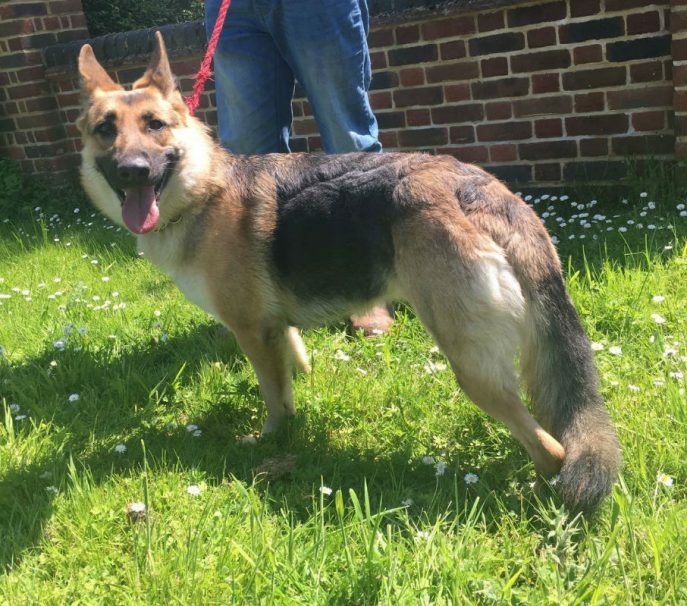 Now in kennels we needed to find out a lot more about this poor girl who seems very nervous of life and will need a calm and confident home to help her in the future. 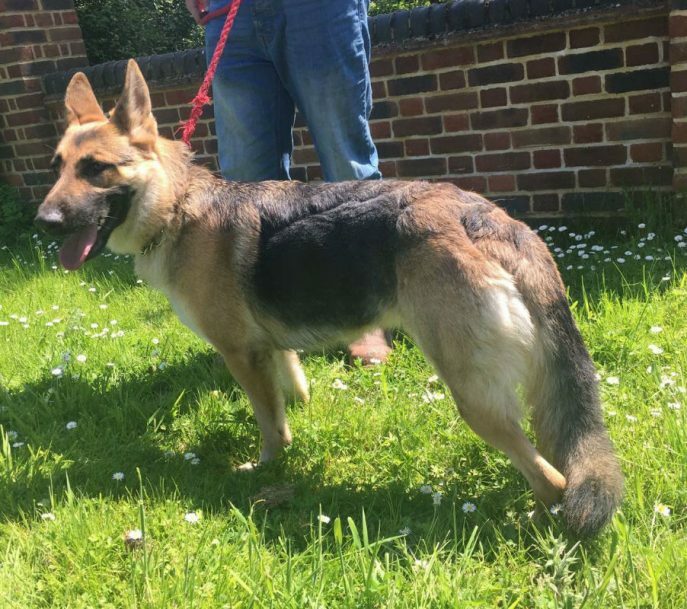 Her instinct was to run rather than fight however she has turned out to be super with other dogs! “Hunny is the iconic Shep. in miniature. Beautiful coat, healthy and athletic. 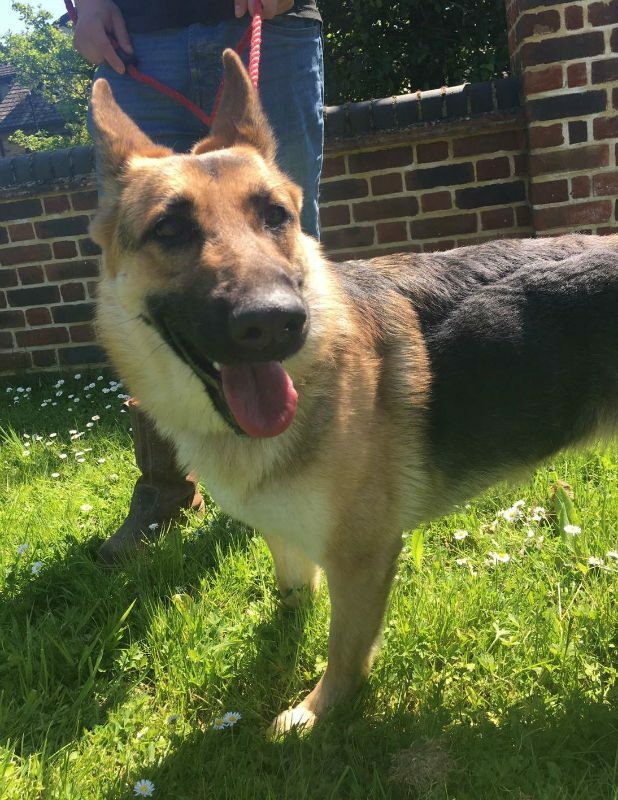 Fully house trained, loves to play with a ball which she will give back each time and takes treats really gently. She was very well behaved in the car but was a little sick on the way home. She loves her walks and although she does pull a little is very manageable and takes no notice of passers by or traffic. She is an enthusiastic, if messy, eater and usually ends up saving a scrap of food on the end of her nose for desert. She mostly ignores our dog (which suits him as younger dogs can interfere with the old boys 20 hours of sleep), but was fascinated by my daughter’s Cavalier KC when she called in and was touchingly gentle with the little dog. We have had quite a few visitors this week and whilst excited and vocal, she has been no real problem. She is what we used to call a good house dog as she will raise an alarm at anything she sees or hears. Having said all of that, Hunny lives on her nerves, she will let me stroke her ears etc. but always at arms length and she’s like a coiled spring, shooting off at any sudden movement or noise. She is much better with my wife and will lay down and let her stroke her. However, because she has less fear she will worry my wife to play with her, barking and mouthing at her fingers, it reminds me of a puppy, chasing it’s mother. chewing at her ears. My wife thinks that this could be frightening for anyone not used to dogs and could be mistaken for aggression. Hunny will come, sit, stay and give a paw but only if it involves a treat, otherwise she totally blanks you. 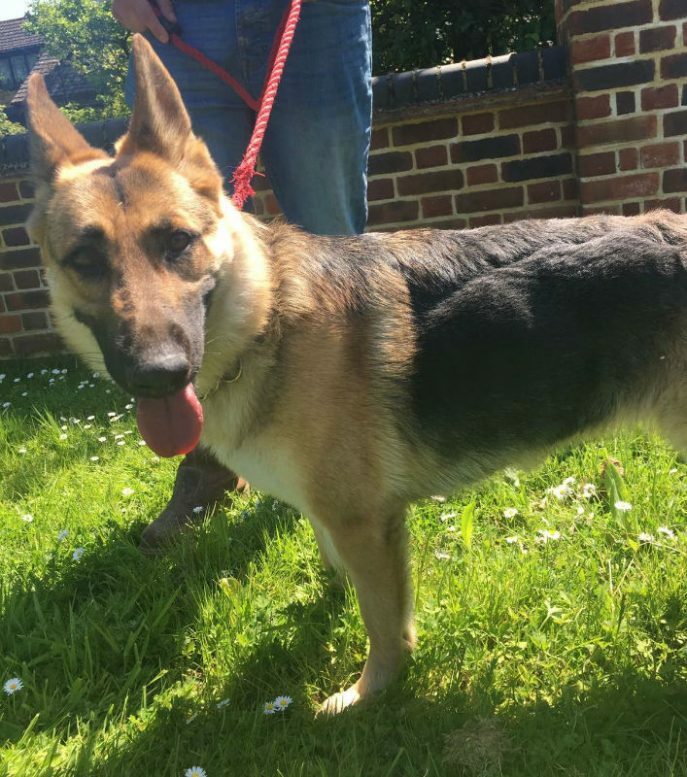 Anyone giving her a home will need to give her lots of time and reward based training. 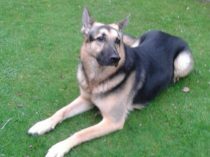 Initially we gave her the total freedom of the house and garden, we do this with all of the dogs because it builds their confidence, she will come to you for treats in her own good time but likes to keep her distance. As I write this she is sleeping about 6′ away, dead to the world, but as soon as I move she will be up. ready to run. 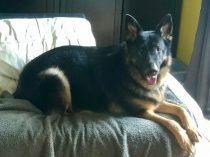 Hunny did go into a potential forever home where she took a good 24 hours before she would trust the man of the house. Sadly when grown up son came to visit she did not trust him at all. 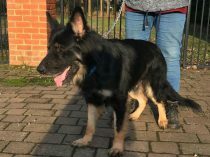 She then went to another potential forever home with another dog, however the period she needed to bond with the man was not easy with a resident dog who obviously wanted to ensure his dad was safe. It also appears she is highly reactive to certain sounds, predominantly mobile phones and hairdryers. Makes you wonder what this poor girl has been through. Hunny’s ideal home would be with females with minimal male traffic please.